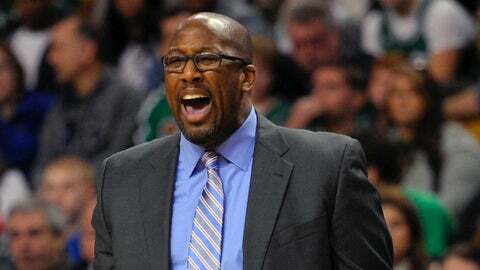 Cleveland Cavaliers head coach Mike Brown during the first half against the Boston Celtics at TD Garden. BOSTON (AP) — Jeff Green and Jordan Crawford each scored 19 points, Brandon Bass added 15 points and had a game-saving blocked shot in the closing seconds Saturday, and the Boston Celtics held on for a 103-100 victory over the Cleveland Cavaliers. The Cavaliers were playing soon after suspending center Andrew Bynum indefinitely for "conduct detrimental to the team" and banning him from all team-related activities. Bynum, who signed a two-year, $24 million contract with the Cavaliers in July, did not travel with the team to Boston and it’s likely he has played his final game for Cleveland. Avery Bradley added 18 points and eight rebounds for Boston, which snapped a three-game losing streak. Bass also had eight boards. Kyrie Irving led the Cavaliers with 32 points, the eighth time in his last 10 games he’s scored 20 or more. Dion Waiters scored 17 and Jarrett Jack 14 for Cleveland, which lost its fourth straight. Jack nailed consecutive 3-pointers, the second closed it to 98-94 with 2:38 left. Cleveland had it down to four points twice again before Waiters’ two free throws made it 102-100 with 43.3 seconds left. After Jared Sullinger shot an air ball 3-point attempt from the right wing that went out of bounds with 19.3 seconds left, Bass blocked Waiters’ shot in the lane and Bradley nailed one free throw with 1.4 seconds left. Bass’ 3-pointer — just his second this year — had pushed Boston’s lead to 64-44 early in the third quarter. Crawford then had a layup, giving the Celtics their largest lead of the game (66-44) 2 1/2 minutes into the third. The Cavaliers didn’t get the deficit lower than 16 points the rest of the quarter. But they made things interesting midway into the fourth. Cleveland scored nine of the quarter’s initial 10 points, slicing the gap to 86-75 on Anthony Bennett’s free throw with just under 9 minutes to play. After the teams traded baskets, Irving hit a pair of 3s to trigger an 11-4 run that closed it to 94-88 with 5:39 left. He capped the run with a driving, spinning shot in the lane. But Kris Humphries and Green each hit two free throws, giving Boston its 10-point lead with 4 1/2 minutes left. Boston led 59-44 at halftime. In the first half, the Celtics scored 11 of the second quarter’s final 15 points en route to their 15-point halftime edge. Crawford started the spree with a 3-pointer with just over two minutes left. Green had a three-point play and Bradley added a 3-pointer. NOTES: Boston next plays Tuesday afternoon when it hosts Atlanta in the opener of a day/night NBA/NHL doubleheader. The Bruins face the New York Islanders at night. 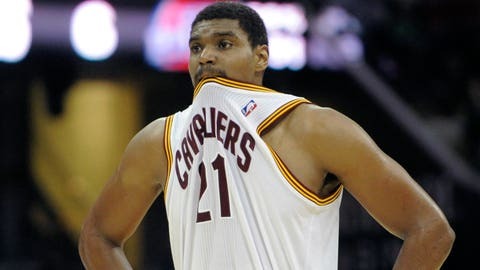 … The Cavaliers host Golden State Sunday in what was scheduled to be an `Andrew Bynum Fathead Giveaway’ game. … Green had a neat 3-point play late in the second when he was fouled on a drive and the ball bounced on the rim six times before dropping in. The crowd counted the bounces out loud when the replay was shown on the Jumbotron. He then hit the free throw. … Cleveland lost for only the second time (5-2) when Irving scores 30 or more points. … The Celtics won the first meeting between the teams, 103-86 on Nov. 29 at TD Garden. They meet for the final time in Cleveland on April 12. … Interesting sight in the media dining room pregame: Cleveland guard Matthew Dellavedova and center Henry Sims joined the press for a meal wearing their game shorts and warmup tops.